Politics and civic life are vital to any community. This section explores racial disparities in access to politics and how people of color have been oppressed and disenfranchised by government decisions. Democracy has always been considered the backbone of the United States. The word democracy essentially means “the people rule,” but American history demonstrates that not all people have had access to equality and power. The Founding Fathers did not actually want everyone involved in politics. They believed the majority of citizens were not educated enough to make informed decisions to benefit the country. At the time, Native Americans, black people and Latinos in the United States were not even regarded as citizens — or even fully human — and were therefore left out of the political arena. Even Thomas Jefferson wrote about the biological superiority of white people over people of color, specifically Black Americans. Although most citizens in the United States can become involved through voting and political action, systems remain that dilute the influence and voices of people of color. These systems can critically affect their quality of life. The United States has a long history of voter suppression, first only allowing white, male property holders to vote. Today, most people can vote. The one exception in most states is convicted felons, which has racial implications because people of color are disproportionately incarcerated. As of 2012, about 6 million people could not vote in the United States because of felony convictions. Another tactic used to suppress voter participation is the voter ID law. Voter ID laws require a government-issued ID in order to vote. These laws are usually justified as a way to reduce voter fraud, although studies indicate that it is not a widespread problem. 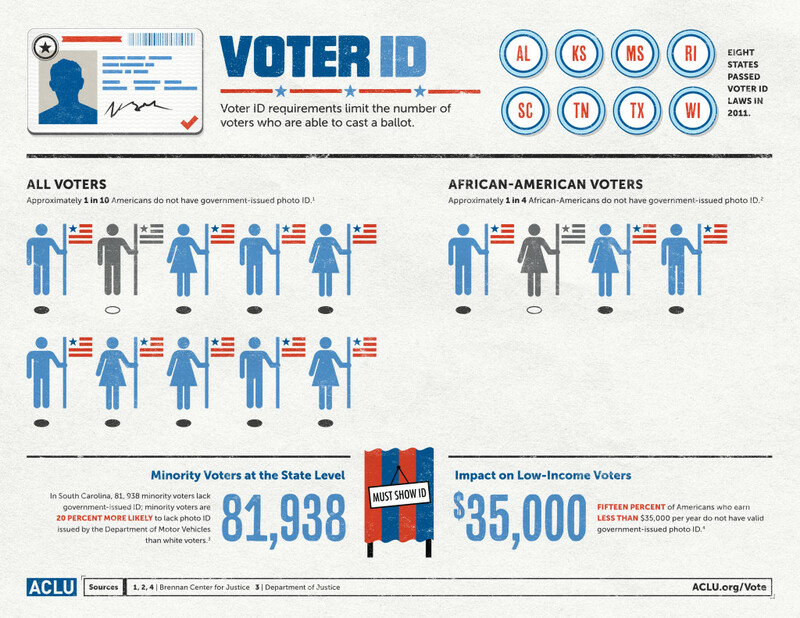 Voter ID laws tend to affect people of color, women and the poor (who are disproportionately people of color). In order to get a government-issued photo ID, one must get an official license, which requires adequate time and transportation. On top of this, government IDs are not free. To acquire a government-issued ID, women must prove their identity, which is more difficult given marriage conventions. Procuring the documents can be difficult and costly. There also can be a Catch-22: In some places, securing a copy of a marriage license requires a government-issued ID. Election protocol can also be a voter deterrent. Long lines plus inconvenient polling hours and locations can suppress voting. During the 2016 presidential primaries, accusations of voter suppression were filed inArizona and New York. 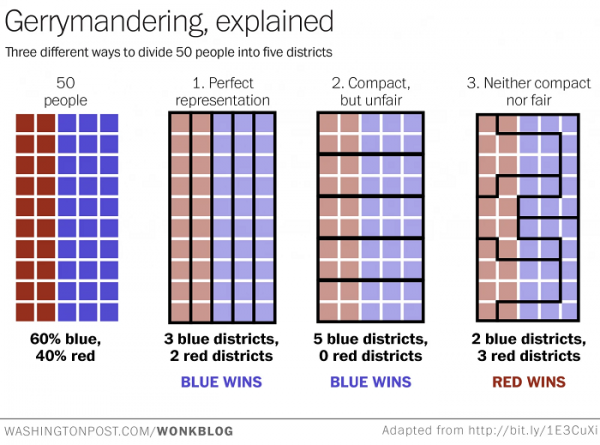 Gerrymandering is a widely criticized practice, but it is not in the best interest of legislators to change the way it works. Even while legislators serve their terms, they are usually in a campaign to be re-elected. This means fulfilling their campaign promises, making appearances in their district, appealing to voters and putting their interests above the best practices for state or country. Every 10 years, lawmakers get to redraw the legislative districts, often packing them full of people most likely to put them back in office. This has had very real consequences in diluting the vote of racial and ethnic minorities, particularly in the U.S. House of Representatives. The cry for more minority representation in Congress has led to the rise of majority- minority districts. Although this gets more people of color elected,it creates another problem. Packing minorities into a few districts bleaches the surrounding districts, leaving the representatives of those districts to ignore minority interests. As a result, fewer people in Congress are thinking about them. Because candidates only need 51 percent of votes in order to win, packing districts with favorable constituents makes it less probable that representatives will take a broad range of interests into account. Gerrymandering has also been used to split and dilute marginalized communities, which pushes voters into second-class status in these districts. Or the district lines are drawn so marginalized voters are technically the majority but share the district with well-educated, high-income white constituents who are more likely to have clout. Food deserts are low-income urban or rural areas where there is little access to healthy food. According to research by the American Civil Liberties Union, 23.5 million Americans live in low-income neighborhoods where the nearest supermarket is more than a mile away. Black Americans are half as likely to have access to chain supermarkets, and Latinos are one-third as likely to have access, as opposed to non-minority communities. According to this same research, government policies and incentives for businesses — or lack thereof in certain areas — have greatly contributed to the creation of these food deserts. Food deserts enemy No. 1 in minority, urban areas from Tey-Marie Astudilloon Vimeo. As more racial minorities moved to cities and white people moved out to suburbs in the mid-1900s, supermarkets followed them. Racial segregation in cities and a number of different institutions, including housing policies, financial policies and government regulations, have contributed to the persistence of food deserts. The discussions around food deserts often blame the victims or don’t take the full range of institutional causes into consideration. Although policies were not necessarily made with a racist intent, by ignoring the history of race and segregation, communities of color have been left with fewer resources. Institutional racism has played a big role in the way neighborhoods are structured and which ones get resources. As whites moved from cities to suburbs, landlords were left with empty, even devalued, properties. They would rent these properties to people of color who were desperate for housing. Some rental agreements made tenants liable for repairs, and some landlords were stingy about heat and other utilities . Landlords would often scam people of color, not interested in actually taking care of their tenants or property. Some went as far as to setting their buildings on fire to collect on insurance, displacing their tenants. Meanwhile, those in the suburbs benefited from loans through the Federal Housing Administration, while blacks and others faced discrimination. The mortgage industry operated in much the same way, allowing white families to buy and expand homes while refusing black families the same opportunities. The result was de-facto segregation. When looking for sources, find the voices that are missing and incorporate them. Spend time in different communities, particularly those outside your network. Communities of color are aware of socio-political problems and often willing to talk about them. It is the journalist’s job to listen. Visit community centers, churches, neighborhood pubs. Talk to community or religious leaders, academic scholars in the area, and activists. Remember race does not exist in a vacuum. Race can intersect with class, sexuality, gender identity, ability, religion, immigration status and age. Problems that affect communities of color often have historical roots.  Reporting needs to go deep to examine institutional frameworks that can explain how and why injustices developed. Readers need to understand the cultural and structural shifts that must occur for communities of color to achieve equality and lasting justice. Good stories that incorporate race and find the root of issues take time and research. There needs to be an understanding of sociological patterns regarding race, gender, and other identity intersections.